There is a new group in Montreal waging war on the ridiculous high price fares at VIA Rail Canada. The Collective Against Empty Trains has started a petition and website in english and french. They are fighting against what many Canadians have known for years, VIA Rail's high fares keep people from taking the train. The following photo from the Empty Trains website clearly demonstrates the effect of VIA's high prices between Quebec and Montreal. 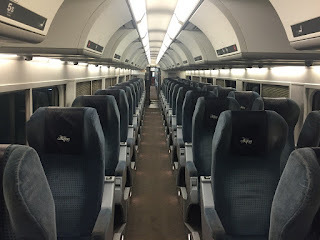 Photo taken aboard the Quebec City-Montreal Train 29 on April 23rd 2018 showing two "cars" (#5 and #6) which stayed entirely empty during the whole trip. Tickets for this train were going for 69$ (one way) at the time of its departure. The Collective states that one way Quebec City-Montreal fares should always be available until all seats sell out in the 20$ range. Such a price would most certainly fill a lot of the empty train seats that are a common sight today. This fare pricing makes sense but VIA Rail's pricing results in the empty seats as shown above. This is, indeed, an issue that no one at VIA ever wants to discuss. The current hack at the helm went ballistic at the 2017 Annual Public Meeting when someone raised a question about it. But look on the bright side. The CEO's contract expires next spring. Any bets on whether this Conservative appointee gets renewed by the Trudeau government? The next question then becomes whether this government does any better when hiring a replacement. "Garbage out, garbage in" seems to be the constant rule in Ottawa.